The age of sail returns to Falmouth this August with the Falmouth Tall Ships Regatta. Over 40 Tall Ships are due to visit Falmouth, sailing in from across the globe. After four days of festivities, the race to Greenwich will begin on 31 August. The Regatta is a real celebration of Falmouth’s seafaring past. From schooners to brigantines, luggers and barques, there are several different types of Tall Ship, and each has a story to tell. You can find out more about each of them on the Regatta website. 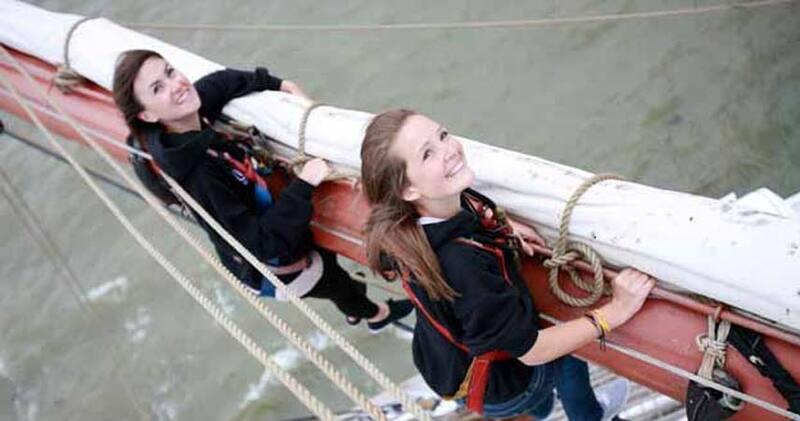 All the ships are now sail training vessels and regularly take groups out for a taste of adventure on the high seas. If you’ve always wondered what it would be like to set foot on one of these magnificent ships, then now’s your chance. The Tall Ships will be moored at Falmouth Docks and welcome visitors in the run-up to the race. It’s free to go on board and look around, and you don’t need to book a ticket. There’s a great programme of events planned including live music and entertainment, exhibitions and children’s activities. Highlights of the weekend include the crew parade through the town centre on Friday 29 August and a firework display on Saturday 30 August. On 31 August, the Tall Ships will take part in a spectacular Parade of Sail along the coast before race begins. From the starting line in Falmouth Bay, they’ll head east towards the finish line at the Isle of Wight. After the race, the Tall Ships will sail together towards London and up the River Thames to Greenwich, where the celebrations will continue. The Big Art and Storytelling project is a national children’s art and writing competition and exhibition inspired by the Falmouth Tall Ships Regatta. Artist John Dyer’s painting “Tall Ships and Small Ships 2014” is the the official image for the Regatta. It’s an exciting, vibrant piece of art which captures the atmosphere and the festivities of the event. Using his painting as a starting point, children across the country are invited to develop their own creative work – which could be a painting, a collage, a play, a poem or a story. All the entries will be exhibited online, and the top 200 art entries will be exhibited in the National Maritime Museum Cornwall and Greenwich Heritage Centre London. You can watch a video of John Dyer at work on his painting and talking about the project on Big Art and Storytelling website. From Bosinver, it takes approximately 45 minutes to drive to Falmouth. As lots of people will be travelling to Falmouth during the Regatta you might find it easier to travel by public transport. There are regular trains from St Austell to Falmouth, and the station at Falmouth Docks is only a short walk from where the ships will be moored. Alternatively, if you fancy getting out on the water you could travel to Truro and then take a boat to Falmouth.